Well it has been quite the year, 2015 that is. Unfortunately, I haven't had the opportunity to sew and quilt as much as I had hoped. However, we are about to begin a new year and it is always a good opportunity for me to "re-evaluate" my life and change focus if needed. I hope to do just that and put more focus on my sewing and quilting than I have done over the previous couple of years. One of the things that I would like to do is "stretch" my capabilities and try new things. One of the things that I tried over the month of December was some "hand quilting". I had been promising my nephew a pocket pillow to hold his books but was unable to get it done for his birthday in September so I thought that I would redeem myself for Christmas. I really like how it turned out. The fabric I used was "On Our Way" by Riley Blake. I essentially made up my own pattern. I used a 14 inch pillow form. For the pocket I used one 4 1/2 inch strip and two 2 1/2 inch strips. I embroidered my nephew's name on the middle strip. The font I used was the Cutie Patootie Alphabet by Bunnycup Embroidery. I just love their embroidery designs. They always embroider up very very well. For the pocket I hand quilted using the DMC 8 perle cotton in black. I just loved the result. For the pillow front, I hand quilted using that same black perle cotton every inch. Hand quilting was very therapeutic after I bought myself a thimble because you have to use a larger needle when quilting with the perle cotton, which was hurting my index finger pushing it through the quilt sandwich. Once I was finished, I sewed it together with an envelope enclosure back, which I forgot to get a picture of. But here is the finished product after the books are added. Plus I added a little lego set as well, what boy does not love legos! My nephew definitely loved it! Isn't he cute! 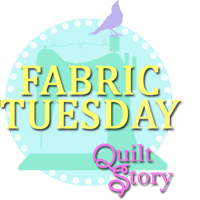 Linking up to Fabric Tuesday hosted by Heather and Megan from the Quilt Story. I can't believe it has been so long since I last blogged! It was a crazy busy summer and so far has also been a crazy busy start to the school year for us. My youngest has had a hard time adjusting to our new schedule, but slowly things are improving. Well now that I am back, the first thing I decided to do was join a quilt along. 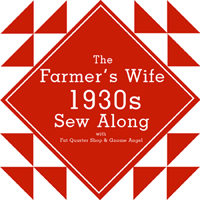 Angie from the Gnome Angel is hosting the Farmer's Wife 1930's Sampler Quilt Sew Along. 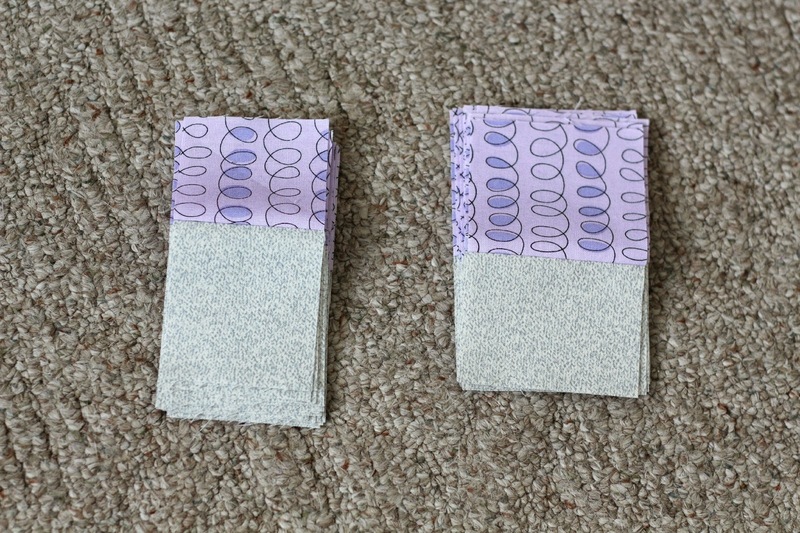 The fabric that I am going to use throughout the quilt along will be from Bonnie & Camille. I decided to stick to one designer, but am using a bunch of their fabric lines such as Vintage Modern, Scrumptious, Daysail and Vintage Picnic. I have to wait to use the Vintage Picnic line because that one does not come out until February 2016. 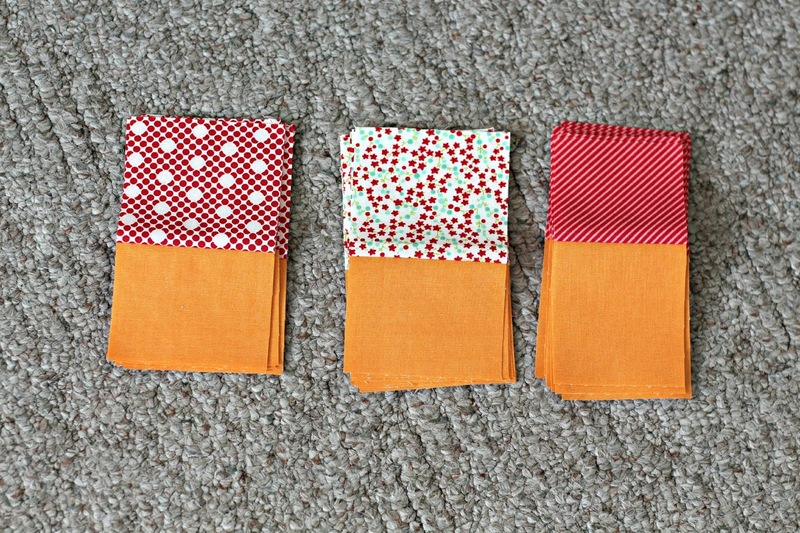 I will be hand piecing these blocks because I wanted to make this quilt like someone would in the 1930's. I have never hand pieced before, so I am going to leave myself open to use my sewing machine if I get too far behind. I have totally enjoyed this process. It is a great thing for me to do while I watch TV with my children and my husband. I feel like I can spend some quality time with them as well as enjoy something that I love as well. It also helps that all the new Fall shows are coming out too! So first up is Block #12 - Becky. It turned out perfect! Again I highly recommend hand piecing. It is very therapeutic and relaxing. Here is the second block #16 - Bonnie. I really like how this block turned out as well. I didn't complete the 3rd block #8 - Aunt, but will get caught up sometime next week. Linking up to the Farmer's Wife 1930's Sampler Quilt Sew Along hosted by Angie from the Gnome Angel. I am grateful that we are finally headed into summer! We wrapped up our last week of school yesterday and had Mae's dance recital this evening. It will be so nice to enjoy some relaxing days by the pool, sleeping in, and finally some time for quilting. We have had a lot of yard work lately and still quite a bit more to do, but hopefully with a lot less running around more stuff in the house and around the house can get completed, which brings me to my goal for June. 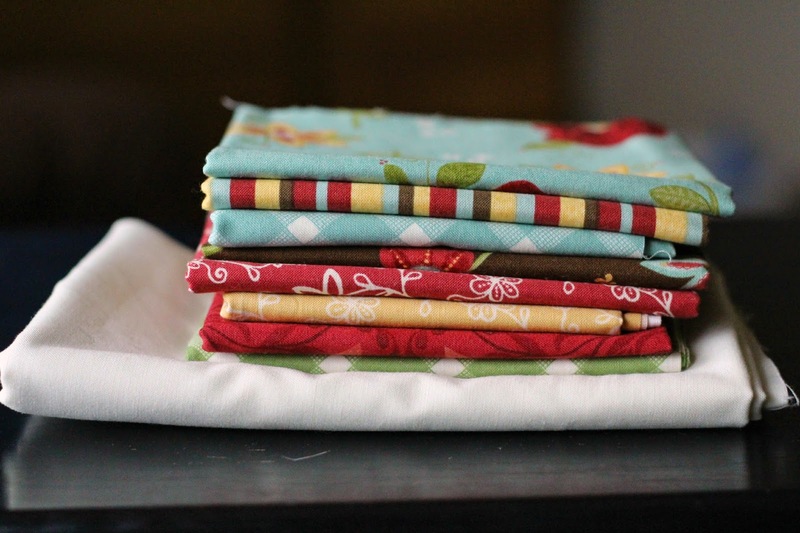 I started these pillow shams about a year ago now and it is time to get them finished. It is a tutorial by Maureen Cracknell from Maureen Cracknell Handmade, which you can find here. I just loved them. My oldest daughter's bedroom is Cinderella. I really need to get this done because I think my "Cinderella" days are coming to an end with her. 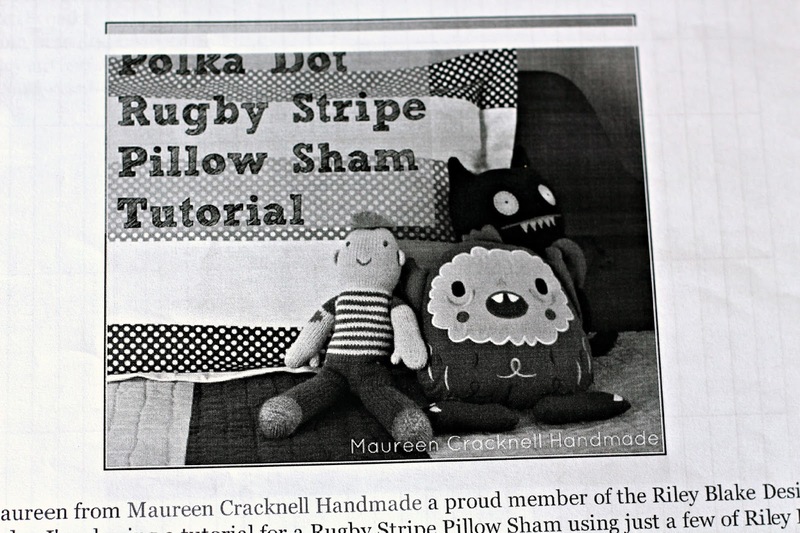 I have only had the fabric for several years now and I started this pillow sham about a year ago! 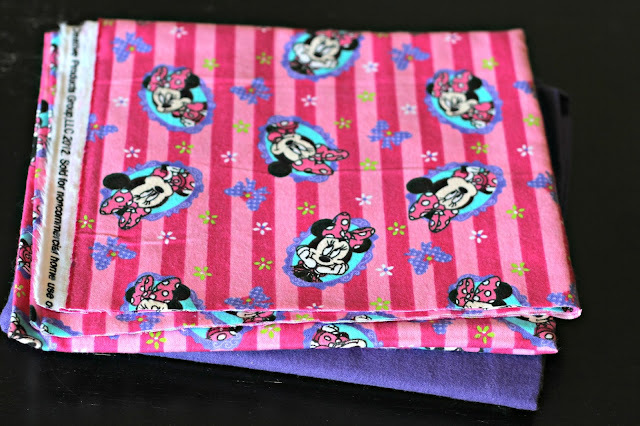 My youngest daughter has a Minnie Mouse bedroom, so I am going to make one for her in Minnie Mouse. I haven't started hers, but I am hoping that both of them go pretty quickly and will give me an excuse to put out the summer sheets, wash their comforters, and summer-ize their bedrooms. 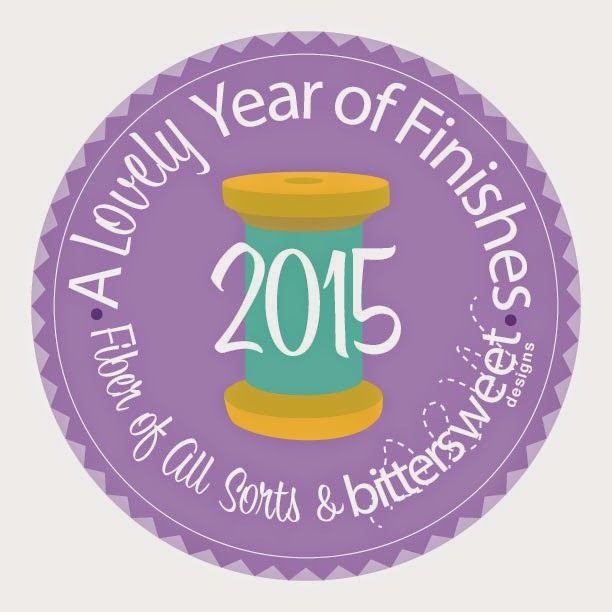 Linking up to 2015 - A Lovely Year of Finishes hosted by Melissa from Sew Bitter Sweet Designs and Shanna from Fiber of All Sorts. It is that time of year again, the Blogger's Quilt Festival. This is my very first time ever entering this quilt competition and I am extremely excited to be a part of it. 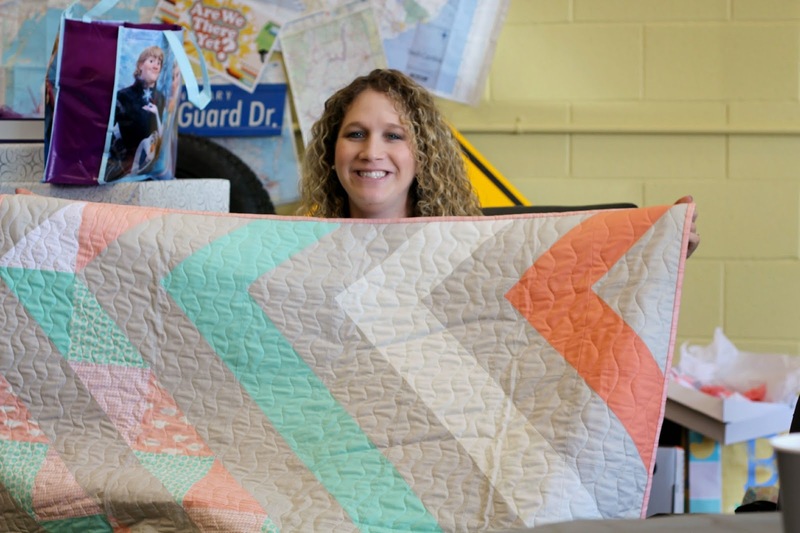 There are always so many beautiful quilts that get entered and I love to see everyone's hard work and hear the "stories" that go along with them. This quilt definitely has a special story. I must say that this quilt was made for a fighter. My sister was pregnant with her first born daughter and she ended up delivering early due to severe complications with pre-eclampsia. 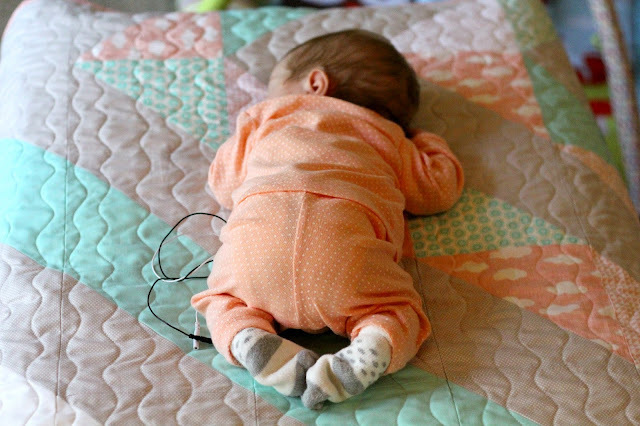 The baby had quite the up and down road in the NICU for 5 weeks, but she is now home with her mother and doing well. She will continue to be monitored closely by her doctors over the next year, but like I said this beautiful little girl is definitely a fighter. Now more details about the quilt. My sister found this pattern she liked on pinterest, so I drew it out on graph paper because I was unable to purchase a pattern for it. 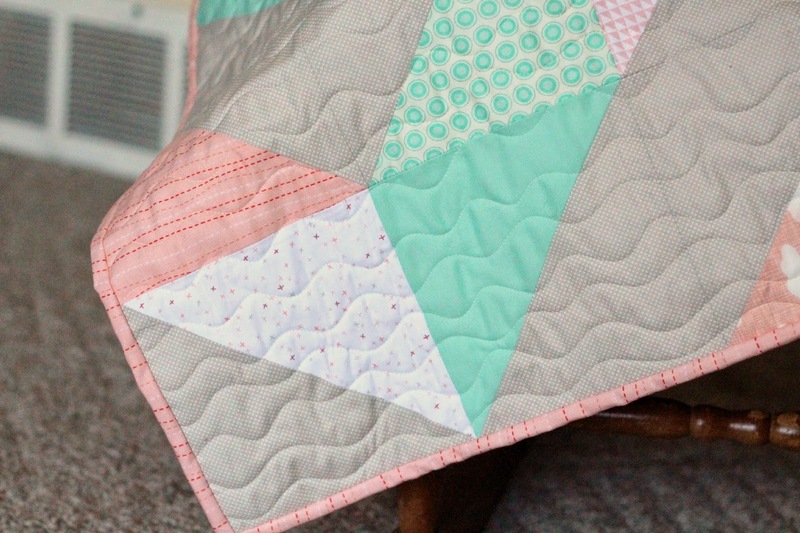 She chose the same color pallet for the quilt as she had in her wedding and I must say that I just love how all these different fabrics came together and complimented each other perfectly. I especially love the gray dot background I ended up using. 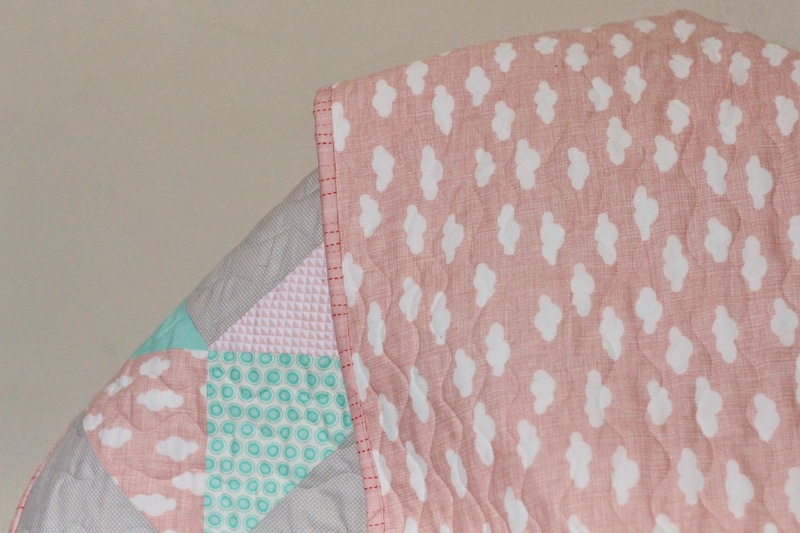 My sister's favorite fabric was this coral cloud fabric which I used on both the front and the back of the quilt. I made the quilt out of 48 6.5 inch (unfinished) half square triangles. The quilt finished at 36 inches by 48 inches. 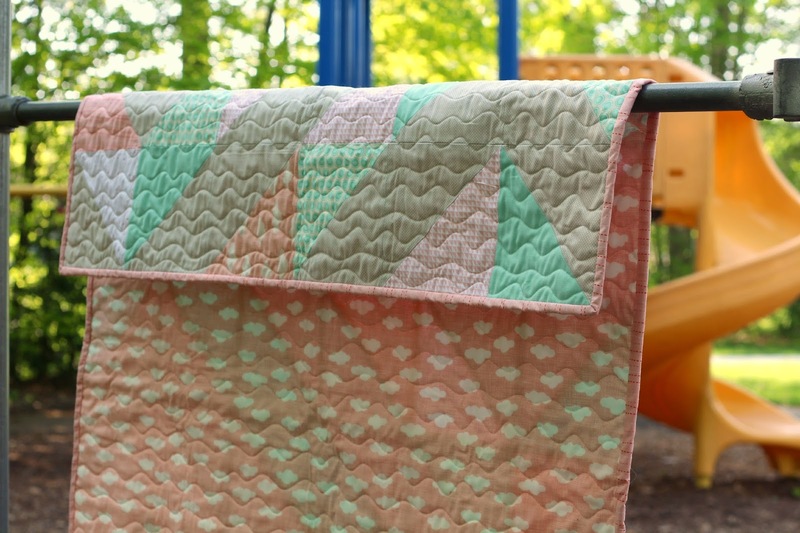 I chose a wavy quilt pattern, which coincided with one of the fabrics used in the quilt. I also used this same coral wavy pattern for my binding. 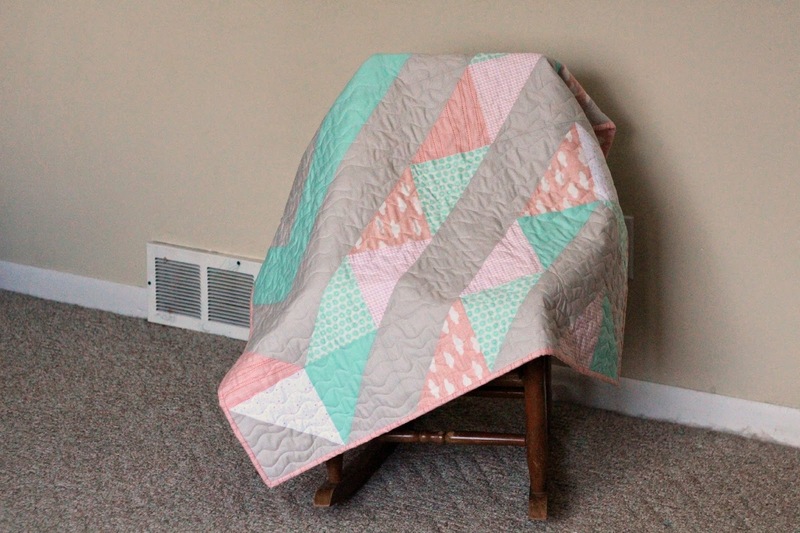 I "borrowed" the quilt back from my niece because I photographed it back in February 2015 when I had finished it. During that time it was winter, which equals very cold drab weather and not the greatest pictures. I must say that I love these pictures so much more plus now you are also able to see my adorable little model. She is definitely a keeper! Linking up to 2015 - The Blogger's Quilt Festival hosted by Amy's Creative Side. I just bought this new book on my kindle called "Love the Home you Have" by Melissa Michaels, which I purchased last Tuesday and I haven't been able to put it down. I wish I could have photographed it for you guys because the cover is just super cute, but I purchased it on my Kindle which does not photograph well. Bummer. It is such an awesome book though. Something that I really need to read right now. It basically talks about how to "fall" in love with the home you already have. In Chapter 4, she talks about your home love language and what she means by that is your home is your own blank canvas waiting for you to put your own touch on using your own creative talents. 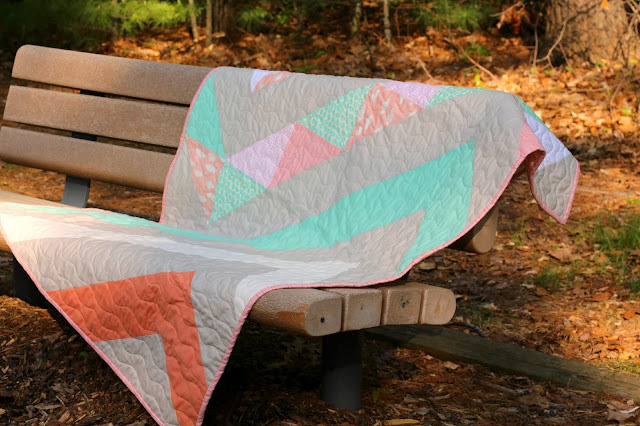 Well here I am a quilter, and do you know that if you were to walk off the street right now into my home there would not be a trace of my love for quilting anywhere! I have no quilted pillows, no quilts, no table runners, or anything like that in the main living areas of my home! Nothing! Anyways, this month I am going to change that. I just love half square triangles. 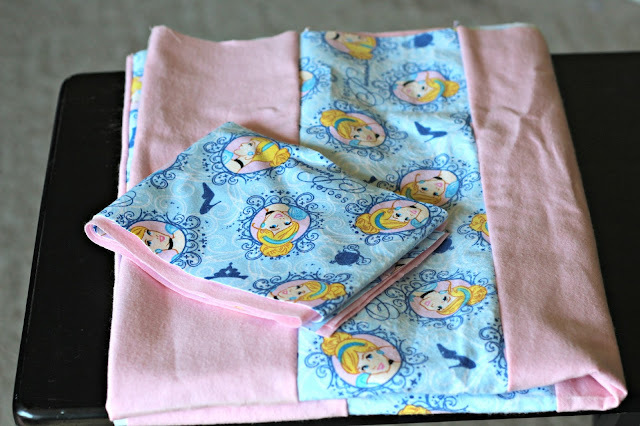 I love to make them and I have a machine quilting pattern that I have wanted to try for some time now. 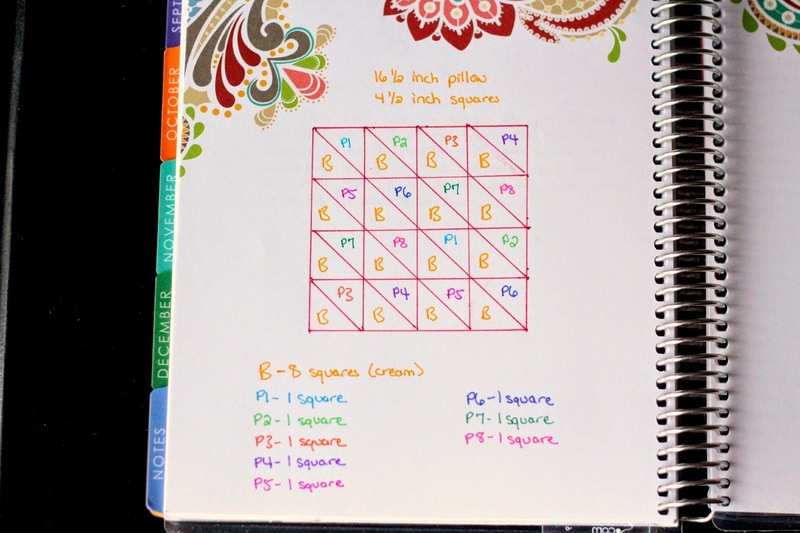 I drew out a simple design that is pretty common in the quilting world that will work well with the machine quilting design that I have in my head. The fabric collection that I have wanted to accent my living room with is called "Rebel Roses" by Heather Mulder. I am not sure if you can even buy it anymore. I have had the fabric for several years now. Big surprise. It has been collecting dust in my basement for awhile and now it is time to finally cut into it. I can't wait to start to add more of "me" to our home by taking the first step and doing something simple like make this pillow! 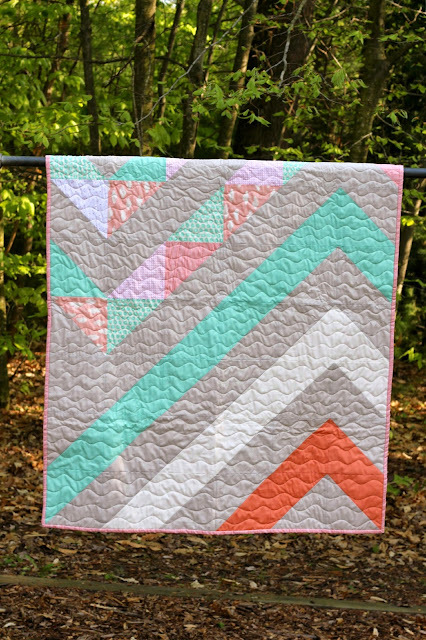 Linking up to the Irish Chain Twist Quilt Along hosted by Melissa from Happy Quilting. February 2015 Goal - Finished! I am so excited to finally share with you my finished goal for February! I couldn't post until today because today was my sister's baby shower and I did not want her to see this ahead of time. I wanted it to be a surprise and I just loved how it turned out! I can't wait to photograph baby Chloe on it. Yes, my sister's baby decided to show up a little bit early, but thankfully everyone is doing great and hopefully Chloe will get out of the hospital soon! So let's get to the pictures because I know that it is everyone's favorite part. At least it is mine. Here is the finished quilt top before quilting! The quilt was a little bit harder to photograph then I had hoped because it was kind of big (36 x 48 inches), but that should make it a great play quilt for Chloe to play on. 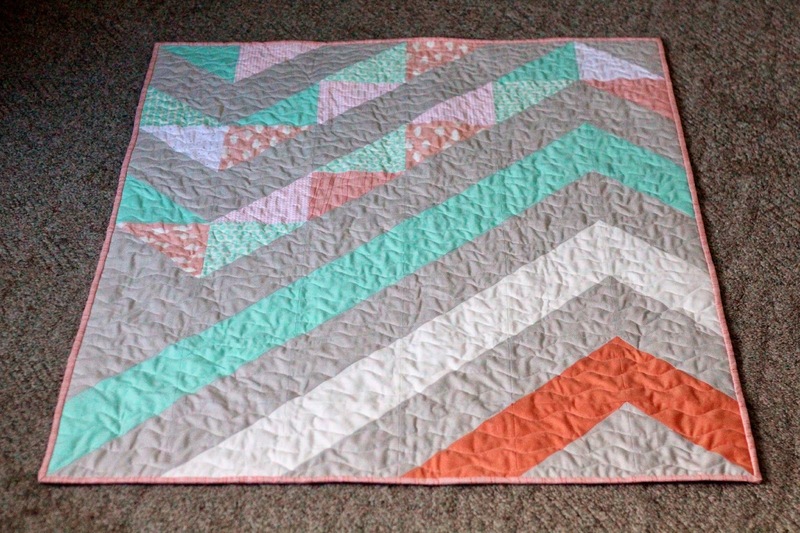 I decided to quilt wavy lines on it because I did not want to detract from the pattern and I wanted it to be soft for Chloe to lay on so dense quilting would not have worked either. 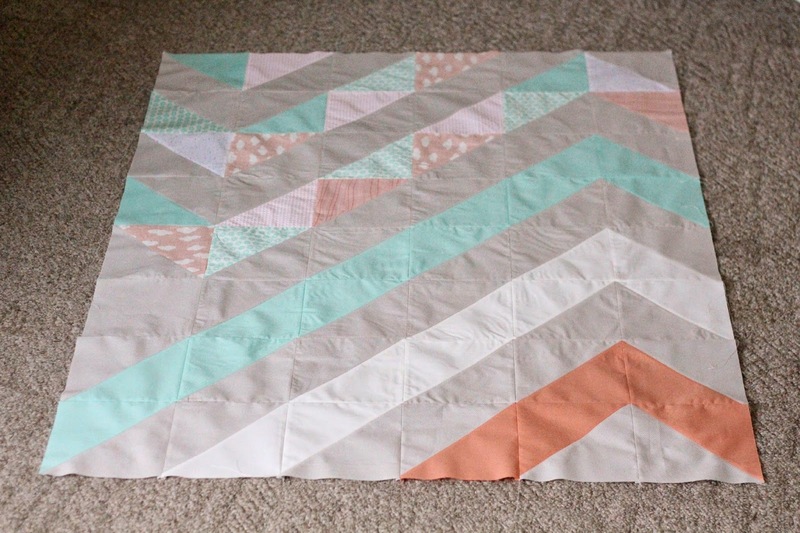 I picked a wavy lines coral print that I had used in the quilt top for the binding. My sister's favorite fabric was the cloud print, so I used this for the back. Here is my sister at the shower right after she opened her gift. I think she liked it! 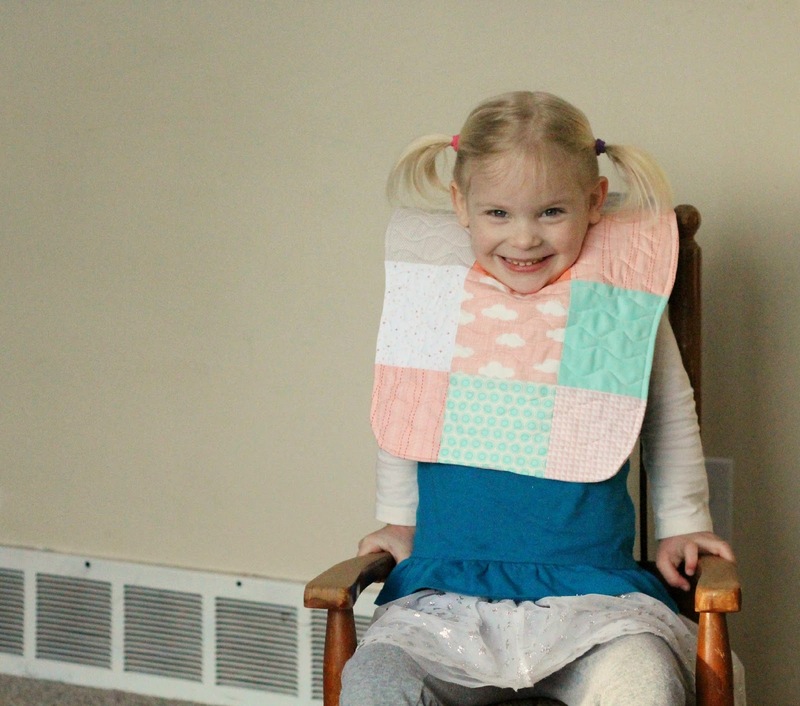 Since I had leftover fabric, I also made her a couple of bibs using Camille Roskelley's Charming Bibs pattern. 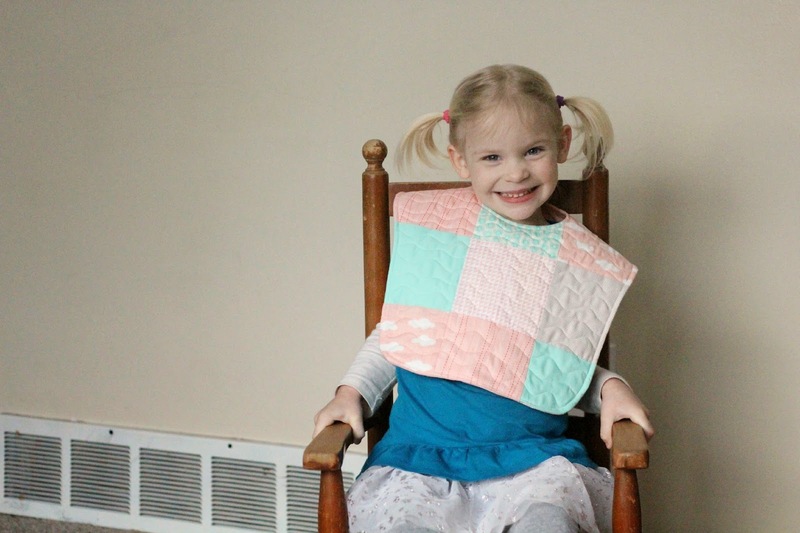 This is a really great pattern and it makes some nice larger bibs for when the kids get older. Here is Bib #1 modeled by my youngest. She is just getting so big. I wish she would stop! Oh well, what can you do. Here is Bib #2. I am a working mom who loves to quilt as much as possible. I just purchased a long arm quilting machine, so please join me on my quilting adventures.